A job search can be daunting, long and hard. If one is going to get disappointed and dejected because of rejections, then your body too is going to be affected and you will soon look pale, weak and lifeless, which means if a sudden interview crops up, you will appear to be in such a despair that the employers may not even consider letting you in for the interview, let alone the job. Hence it is necessary keep a positive attitude, so that you have a cheerful mind which in turn will help maintain a healthy body. The most important way to have a positive attitude about yourself is to realise that you are good and worthy. When you feel good about yourself, you feel more confident which will help you assume control of things around. Being confident means half the battle is won. Sometimes when rejections pour in instead of approvals, one can feel their spirits down but at that juncture, sit down and think what you have achieved so far and feel happy about those milestones in your life. Believe in yourself, because that counts and do not wait for others to say positive things about you, but you will have to initiate it. Say positive things to yourself, say, ‘I am good’, ‘I am capable’ and more such cheering up sentences. What’s the harm in repeating them because you are worth it! Understand that it is you alone who can bring in success. No one else has that ability to do it for you. So, sit up and see around. Take charge of your life and go ahead. Find what you need to make your job search more active. Think of smarter ways and persevere. Just think success is just few steps away and that you have to walk towards it. Relax, it is just a short period of uncertainty. Things will definitely improve. Just focus on the present and stop worrying about tomorrow. Too much thinking of the future means you are spending your precious time in futile exercise, and you can definitely spend it on some fruitful activity such as thinking about how to make your job search more result oriented. You do not have to be embarrassed about praising yourself, at least not during job search. This is the period when you are allowed to be self-admiring. Write down a list of positive things about you, the things that people have complimented you about, words of praise from friends and so on and paste this list near your work desk or opposite your bed, at any place where you can see it more often. During those moments of despair, look up to this list and pat yourself. The positive attitude will come flying to you. When you feel low, you do not feel like waking up and facing the day. This is when you have to shrug off negativity and wake up with a positive energy on an upbeat note. Take up an activity to make you feel fresh and energised, be it a walk or jog or just a stroll amongst greenery or meeting up with friends for a gossip session or rather just listen to music or do anything that makes you happy. A morning well spent means a day that is full of positivity, this is rather true. Sitting dejected in front of TV or computer will bring no result but getting up and moving will. Exercise, join a dance class, go out to party or plan a short day trip with friends and go about being happy. Eat healthy and live healthy, two important points that can bring in a positive change in you. Once you are at your desk, after your cheerful morning routine, make a list of things to do that day and don’t just write about job search and related activities but also include fun activities, such as time for gardening, or reading or a meeting or dinner with family or friends, etc. Stick to the list and you will find that each day of your job search is being spent constructively. This realisation will definitely bring in a positive attitude to your life. A clean and organized living and working space can bring lot of positive energy. Just because you do not have to go to work, doesn’t mean, you should not look your best. Wear good clothes while at your job search because a confident appearance can also make you feel positive. Clear the clutter around you, keep everything organized and neat, especially your work space. You will find many online groups that are from your field. If you are looking for a writer’s job, then you will find many groups on social networking sites and others which you can join, to stay updated about latest job opportunities and trends. You should also join an offline group if you can find any, so that you get to meet people from the same field and gain insights into opportunities that you did not know existed. Joining groups also make you feel that you are not alone and that is a positive thought. Treat this break in your career as an opportunity rather than a setback. You have some time off and this can be a great chance to join a course or learn a new skill. Volunteer your services at a NGO or a group that is committed to social causes. You will learn many things at such places, that no professionals will ever be able to teach you. You automatically get a positive attitude when you have new knowledge and skills to show off. If you are rejected, then do not think it as a personal failure. One job rejection doesn’t mean that you are incapable or inefficient; it just means someone luckier landed that job. Derive lessons from it and move on. Each step of failure teaches you something and this lesson when you grasp, helps you move further towards your goal and success. So, you have a dream job but you are hesitant to apply fearing rejection or you have always wanted to take up a dancing class but did not, fearing ridiculed or you wanted to spend a day at a spa but cannot fearing of the expense? Whatever might be that you have always wanted to do, do it now and do it well. Do not feel guilty. Go ahead. When you procrastinate things, you feel more depressed and you can sense your self-worth going for a toss. When you start completing or accomplishing things, you feel a positive attitude surging in through your veins, so do it now. Accept that there will be times when you will feel depressed and you will not be able to do anything about it. At such times, allow yourself a 15 minute break and feel as depressed as you can and think whatever you want to. But, after the break, push aside all negative thoughts and bounce back. 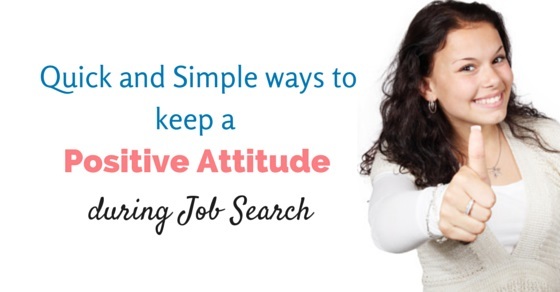 Staying positive always is not that simple, and especially during job search, it can be quite difficult to stay positive and remain upbeat. These are times that test you as a person and you should come out as a winner. Staying motivated is a skill and it is definitely going to come handy during your job search. Follow the above simple and effective steps to instil in yourself a positive attitude, so that even when situations turn from bad to worse, you only turn better to best. Remember, every search ends at some point and this is true for job search as well. A post that deserves your skill and expertise is waiting for you somewhere there, all it needs is to take a walk down there. Maintaining a positive attitude will not make the walk lesser daunting but will give you energy and will to complete the walk. So be calm and stay positive. Previous articleDoes the Type of Degree matter for Employment?